Making a speech needn't mean sweaty palms and a cracking voice. From platform presence to persuasion, this one-semester course teaches your high school students to communicate with confidence. 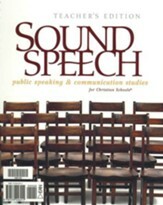 Featuring chapters on topic selection, research, organization, and workplace exchanges, Sound Speech discusses speech guidelines, audience analysis, appearance, and more. Projects include interviews as well as informative, devotional, and persuasive speeches. 340 perforated pages, softcover. 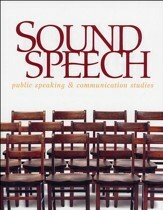 This resource is also known as Bob Jones Sound Speech: Public Speaking & Communication Studies, Student Edition with updated copyright. Grades 9-12. This teacher's edition accompanies BJU Press' sold-separately Sound Speech: Public Speaking & Communication Studies, Student Edition. Reduced student pages are included, with the margins providing teaching tips, objectives, discussion questions, definitions, chapter motivators, project comments, lesson plans and more. 355 pages, spiralbound. This resource is also known as Bob Jones Sound Speech Teacher's Edition. Prepare your students for performing at homeschool gatherings, in church, in competition, and elsewhere! Theater concepts, vocabulary definitions, and dramatic interpretation are covered, as well as creative writing, literary comprehension, performance skills, acting, broadcasting, and production concepts. Exercises are included throughout, providing a detailed workshop on the performing arts. By selecting only a portion of the projects, this course could be used for one semester, equal to one-half credit. 389 pages, softcover. 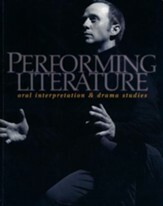 This resource is also known as Bob Jones Performing Literature: Oral Interpretation & Drama Student Text with updated copyright. 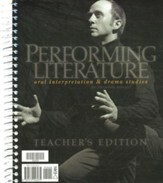 This teacher's guide accompanies BJU Press' sold-separately Performing Literature: Oral Interpretation & Drama Student Text. This guide features a reduced student text, flexible lesson plans, suggested activities, and optional improvisation ideas, as well as eight fully developed performance projects and grading rubrics. With enough material for a full year's study, this course prepares students for performance at homeschool gatherings, in church, and in competition. Teacher notes are designed to help the inexperienced teacher as well as the veteran. By selecting only a portion of the performance projects, this course could be used for one semester, equal to one-half credit. 413 pages, softcover, spiralbound. Grades 9-12. This resource is also known as Bob Jones Performing Literature Teacher's Edition.